The details about the new Fujifilm X-H1 leaked and I thought it might be interesting to see how it compares to the Sony a7RIII. When it comes to video features both cameras are similar and actually, the a7RIII compares more closely to the X-T2 than the X-H1, which you can see here compared to the X-H1. The Sony a7RIII pulls ahead with buffer and still image resolution, but under some circumstances, the Sony will shoot 12-bit RAW files instead of 14-bit. Sony also has one more huge advantage over the competition at this time, that they changed their battery to a modern battery designed for all mirrorless camera operation. The Sony a7RIII is undeniably a better stills camera than the Fujifilm X-H1, but if you need high-quality video the Fujifilm X-H1 might be the first camera worth picking over anything Sony currently has available. 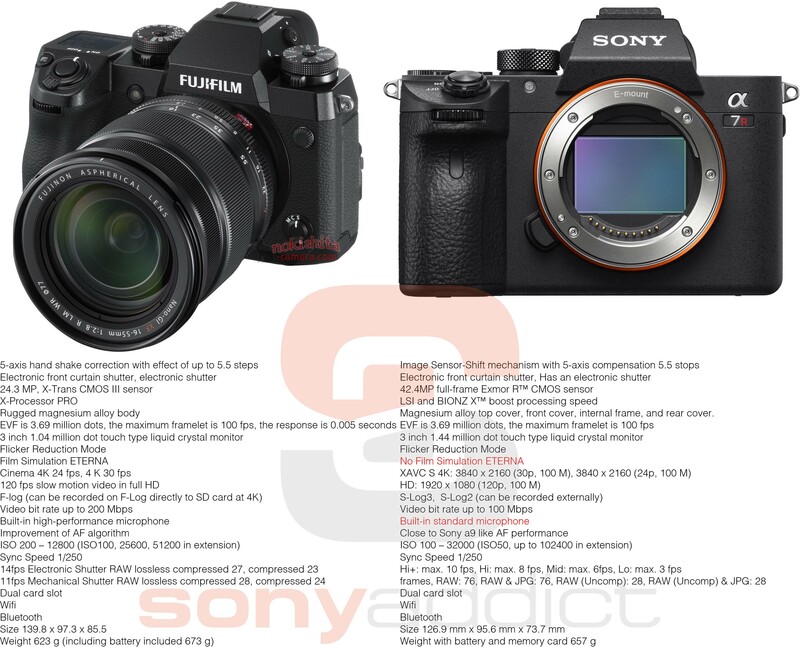 The release of the Fujifilm X-H1 and Panasonic GH5S could push forward the launch of the Sony a7SIII similar to how the release of the Nikon D850 made Sony launch the a7RIII sooner than expected. 2018 is just getting started and it’s already an exciting year for photography. This entry was posted in Sony a7RIII and tagged Fuji X-H1, Fuji XH1, Fujifilm X-H1, Fujifilm XH1. Bookmark the permalink. Trackbacks are closed, but you can post a comment.